5. Tides at Napanee ON? (a) Northport, MI is considered by many local sailors to be one of the top harbors in the Grand Traverse area. It is located up the Leelanau Peninsula, the largest cherry growing region in the United States. Vineyards abound as well. Northport is a popular destination for cruising sailors. Click here to visit Northport, MI. (b) Beaver Island MI If you visited Beaver Island a century ago, it would be common to hear “Maidin mhaith (MA-jin why) – Irish (with a Donegal pronunciation) for 'Good Morning'. That's because from the late 1800's until the early 20th century, Irish was commonly spoken on the island. So many Americans of Irish descent and so many immigrants from County Donegal settled here, that Beaver Island became known as 'America's Emerald Isle'. Of course, before them, were the 'Strangites' – Mormon followers of James Jesse Stang. Strang had himself proclaimed King and ruled Beaver Island for a number of years. Today, it is a very popular destination for cruising sailors. To read more about this interesting island and its fascinating history, click here to visit Beaver Island MI. In January, I spoke at a number of seminars on the topic of cruising the Great Lakes. The seminars were well-attended and it was a pleasure to meet many readers of great-lakes-sailing.com. My underlying theme has always been that these Great Lakes are a phenomenal inland sea system and that we are so blessed to have them at our doorsteps (some 'steps' might be longer than others!). My goal is to encourage people to go out and explore them and see first-hand all they have to offer. From feedback I have received both at the show and afterwards, I expect there will be more people next year with neat experiences to share and stories to tell. Thanks to all who introduced themselves to me – its great to be able to put a face to a name and share some thoughts. In February, I will be speaking at Cathedral Bluffs Yacht Club (Toronto) and at a safety seminar at Fogh Marine (Toronto). If any reader is there, please say 'hello' – it is great to meet each of you. A participant in one of my seminars at the Toronto Boat Show asked me a very good question – “Why do I sail?” She wasn't looking for a quick or glib answer. Rather, it was a more searching question and it was an interesting few moments as we tried to articulate why sailing appeals so much to us. Sailing makes me me feel alive. To move, to reach any destination – near or far – demands that you be in tune with the world around you. The sky, sea state, wind all tell their story and, learning to read, to hear their 'story', means that you can dance with nature. Feeling the wind on my face is bewitching. Imagine – everything that we do on a sailboat is driven by the wind. In fact, wind is the great engine of the world. It drives weather. Yet, it's invisible! The next time you see a flag streaming from its pole, try to see not the flag but the river of air that is moving past it. Or, noticing cats paws on the water, try to see the currents of moving air sweeping over that water. Whether the gossamer threads of cirrus clouds or grey clouds scudding across a leaden sky, try to see the torrents of moving air that drives them. Wind makes me look for things that aren't readily apparent. And seeing them, makes me feel more alive. This is why I sail. 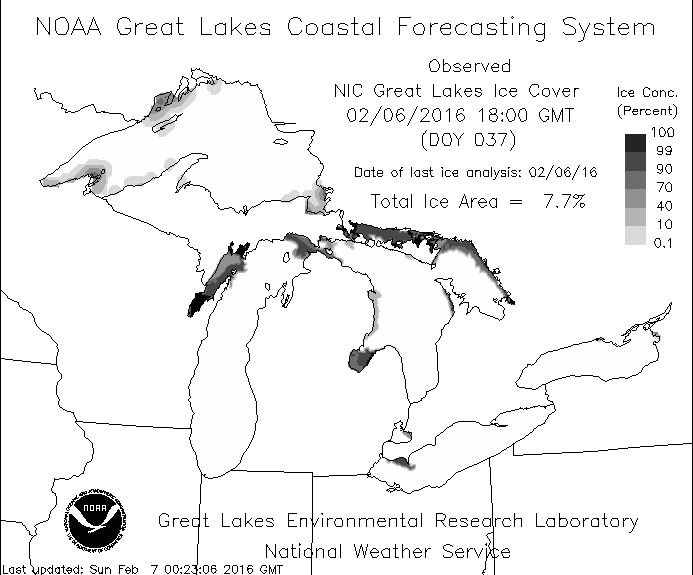 According to NOAA, the current ice cover on the Great Lakes is approximately 8% of total surface area; This time last year, it was about 23% and the year before that, about 35%. Peak ice cover comes in early March. This is often the case when there is a strong 'El Nino'. A diminished ice cover results in warmer waters and this can trigger algae blooms, for example on Lake Erie. Reduced ice cover can also contribute to lower water levels due to evaporation. Nothing in nature happens in isolation. One of the enjoyable things about speaking to various groups are the people I meet and the stories they have to share. After I presentation, I was asked if I was aware of the Napanee (ON) tides. I said I wasn't but that I did know there were minute tidal movements on the Great Lakes but nothing that had to be taken into account. I was assured that there were indeed measurable tides on the Napanee River that occur on a very regular basis. The explanation I was given follows here. When there are steady winds across Lake Ontario from the southwest, they push water to the northeast shore. This phenomenon is known as 'fetch'. Naturally, when the wind slackens, the water surges back to where it came from. This 'rebound' is known as 'seiche'. This occurs over fixed period of time, taking about to 2 hours for a one-way surge between Rochester and the Bay of Quinte, a distance of 110 km. The seiche repeats itself again and again and can go on for several days. The important driving function causing the tidal effect on the Napanee River is the wind. Also key to this effect is the length of the river. The tide runs upriver for approximately 1 hour, peaks and then ebbs back into Lake Ontario. The tide is generally between 6" and 16" (15 cm to 41 cm). This 2 hour ebb and flow coincides with the 2 hour surge and seiche across the lake resulting in a very unique natural phenomenon. If the river were any longer or shorter, it wouldn't work. Talk about nature in harmony! The official Light Lists for Great Lakes waters of both countries are available in the Free Resources section here. Nothing speaks to the romance of sailing as the sight of a tall ship, her sails full and a wave curling past her bow. Well, if that stirs your soul, get ready to enjoy another Tall Ships spectacle on the Great Lakes this summer. Tall Ships America is bringing the Tall Ships Challenge to all 5 of the Great Lakes this summer. The accompanying illustration shows where you can see these great sailing ships.